Do you check your car holster from time to time? Is it getting worn out? Does it need to be repaired or replaced? If you don’t have a holster for your firearm in the car, I would highly recommend you get one. 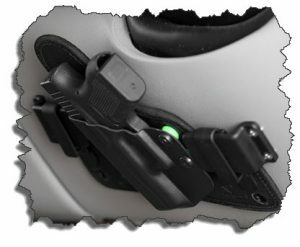 For one thing, it helps you get to your pistol in split seconds and not tugging at your seat belt. You don’t have to fish around in your glove compartment or like some people, who just lay it on the car seat next to them, it may be gone if you have to hit your breaks in case of an emergency. I have a real nice one that is attached to my vehicle and it is within arms reach. Just the other day, I noticed that my firearm was not inserting properly into my car holster. I thought it was me since I cannot see it, it is hidden, but accessible by knowing where its at. I ignored it for a while thinking that it was me banging my firearm around trying to insert it into the holster. Just the other day, I decided to clean my car and noticed that the screws on the mount that are used to hold the holster in place were coming out. That explained why it was off a little bit and it took a few seconds for me to find the opening of the holster to push the firearm through it. I decided to change it up by removing the screws, add split-lock washers and screw it back into its place. The split-lock washers will help prevent the screws from moving over a period of time. Another thing I did was use some loctite for the screws for the holster. I had a frequent problems where the nuts and screws would undo themselves and fall on the floor of the vehicle. Then I couldn’t find the parts. This became annoying after a time since I was tired of asking the manufacturer for more nuts and screws to hold the holster together. The loctite worked wonders. Instead of every other month looking for hardware on the floor, it has been over a year now and not one single piece has fallen out. As your monthly routine, when you clean your firearm and check your body holster, you should also add to your checklist of making sure your vehicle holster and mount are also up to par. You don’t want your firearm hitting the floor or accidentally hitting the trigger when you’re trying to place your firearm back into its holster. Next: Next post: Do You Have a Backup Holster?